When the watermill near Rødkilde Manor on Funen was built in 1754, it had two overshot wheels and four grinders for flour and groats. Today, only one wheel and two grinders are preserved. 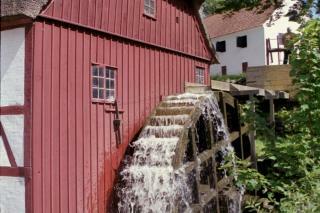 The mill at Rødkildevej 15 in Ulbølle is unique in many respects: It has Denmark's largest waterwheel, measuring 5.65 metres, and was once a starch and powder mill. The mill mechanism was in use as a grain mill until 1960. In 1994, the building was restored by architect Lars Mindedal from Svendborg in cooperation with mill builder John Jensen from Vig. In 1997, Rødkilde Mill was awarded the honourable Europa Nostra award for its expert restoration. Landowner Jens Lange (1707-1790) of Rødkilde was best known for making farmers' lives a misery. But he was also a man with foresight and energy. In the 1750s he had a large millpond dug out. It received water from the ditches that drained water off the estate. This was where the landowner built a grain mill. Five years later, Jens Lange expanded the mill to include a starch and powder factory. In a building adjoining the mill, wheat grain was soaked in water. The grain was then crushed on a millstone and mixed with water. The starch settled to the bottom, was dried and ground into powder. This powder was ready to be used after being passed through the flour mill sieve. At a time when any respectable citizen had a pale complexion and a powdered wig, the mill was worth its weight in gold.